(The tl;dr version is that I configured colors/brightness/contrast on my monitor, and enabled blur reduction, then set up that display profile for 120 hz and then changed the "vertical total pixels" of my resolution settings to 1350). 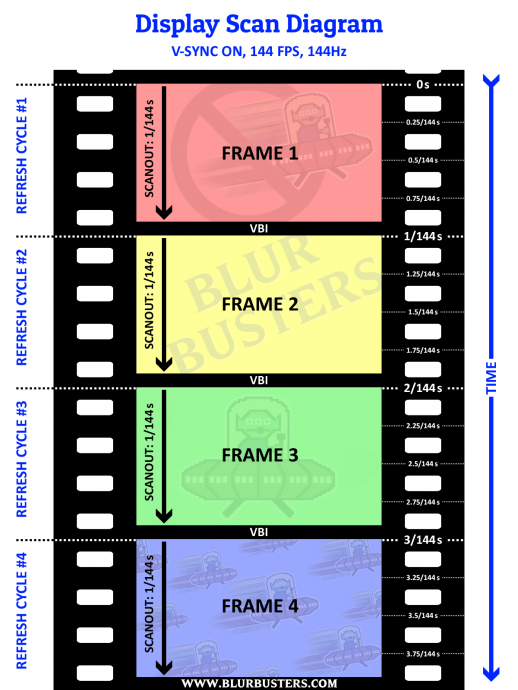 I've followed the guide very closely, but have since then been playing around with the settings in Blur Busters. I am not able to get a perfect picture - in fact, if I make it perfect for my top half of the screen, the bottom half is very blurry, and vise versa. Do you have any suggestions on how to fix this? B. If not good enough, try a lower Hz such as 100Hz, and increase the VT even bigger using Appendix A of Crosstalk FAQ. Start with the dotclock of 144Hz and create a 100Hz mode with a 144Hz dotclock. - For best quality, you should adjust using Strobe Utility Version 2.0.9+ and adjust until image is clearest in screen center. There is a new TestUFO test built into Strobe Utility 2.0.9 which makes strobe tuning massively easier, allowing you to watch strobe tuning in realtime. Blur reduction is achieved via a strobe backlight (flashing once per refresh cycle) to eliminate display motion blur. It's caused by LCD pixel transitions being incomplete on certain parts of the panel surface, since the LCD panel scans top-to-bottom (see high speed video of an LCD) and the strobe backlight is all at once. The asymmetry between panel refresh sequence (sequential) and backlight flash (all at once), is what causes non-uniformities in motion clarity -- aka "strobe crosstalk" often located at top and bottom edges of screen. The "Large Vertical Total" trick can allow you to hide more of the crosstalk zone offscreen -- it allows you to squeeze GtG into the VBI. 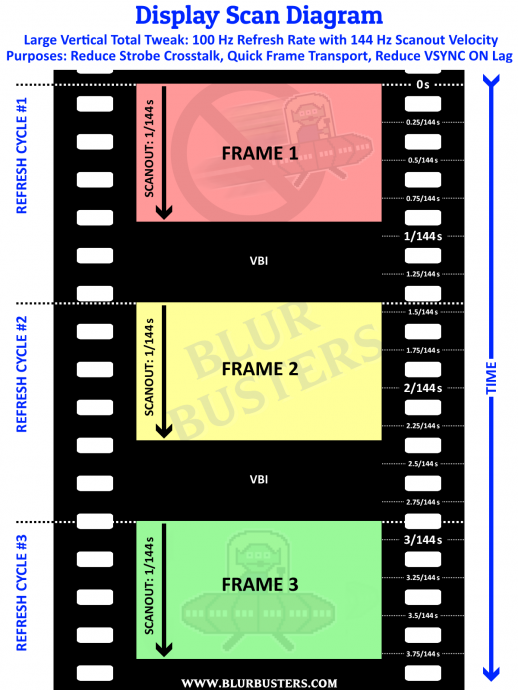 Basically, putting the pixel transitions in the blanking interval (pause) between refresh cycles -- large vertical totals creates longer pauses between faster-scanning-out refresh cycles, creating more dead time between refresh cycles, to let the whole panel's LCD pixels finish transitioning in total darkness, before flashing the backlight, before beginning the new refresh cycle. The larger the vertical total (And/or the lower the Hz), the thinner the crosstalk bars can become. Very little time to hide LCD GtG between refresh cycles. Lots more time to hide LCD GtG between refresh cycles. Not all displays reacts well to Large Vertical Totals. However, XL2411, XL2420 and XL2720 series do (except for the early T-series models that came before first Z series) and they improve significantly. Also, the XL2540 does as well although unlike the 144Hz brethen, its scanout velocity is locked to the highest dotclock (always 1/240sec scanout), however it is happy with large vertical totals and does also reduce strobe crosstalk with Large Vertical Total trick. Also, some LG 240Hz displays behave acceptably with the large vertical total trick (Although not as responsive as the BenQ/Zowie displays). Some displays does the internal scan conversion in the mother motherboard (buffer a slowscan and output a fastscan to panel, internally creating a large vertical total). All NVIDIA displays do this (LightBoost and ULMB) have internally-generated mostly unadjustable large vertical totals that way, and doesn't work well with "on-the-wire" large vertical total tricks. NOTE: Latency-wise, it is almost always much lower-lag to do Large Vertical Totals from the computer-side (BenQ, Zowie, DyAc), rather than letting the monitor motherboard do it. It's more difficult to tweak than ULMB (very easy and good looking at factory settings), but much more tweakable (including ability to less strobe crosstalk than ULMB, especially in the case of super-large vertical totals during lower Hz).